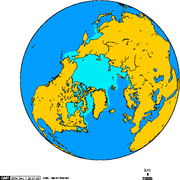 The Arctic Ocean, located mostly in the Arctic north polar region, is the smallest of the world's five oceans and the shallowest. Even though the International Hydrographic Organization (IHO) recognizes it as an ocean, oceanographers may call it the Arctic Mediterranean Sea or simply the Arctic Sea, classifying it as one of the mediterranean seas of the Atlantic Ocean. Much of the ocean is covered by sea ice, either during the colder months or year-round. Little marine life exists where the ocean surface is covered with ice throughout the year. The Arctic Ocean's temperature and salinity vary seasonally as the ice cover melts and freezes; its salinity is the lowest on average of the five major seas, due to low evaporation, as well as limited outflow to the world ocean with heavy freshwater inflow. The greatest inflow of water comes from the Atlantic by way of the Norwegian Current, which then flows along the Eurasian coast. Water also enters from the Pacific via the Bering Strait. The East Greenland Current carries the major outflow. Ice covers most of the ocean surface year-round, causing subfreezing temperatures much of the time. The Arctic is a major source of very cold air that inevitably moves toward the equator, meeting with warmer air in the middle latitudes and causing rain and snow. Marine life abounds in open areas, especially the more southerly waters. The ocean's major ports are the Russian cities of Murmansk and Arkhangelsk. The Arctic Ocean is important as the shortest air route between the Pacific coast of North America and Europe overflies it. An underwater mid-ocean ridge, the Lomonosov Ridge, divides the deep sea North Polar Basin into two basins: the Eurasian, or Nansen, Basin, (after Fridtjof Nansen) which is between 4,000 and 4,500 meters (13,000 and 15,000 ft) deep, and the North American, or Hyperborean, Basin, which is about 4,000 meters (13,000 ft) deep. The bathymetry of the ocean bottom is marked by fault-block ridges, plains of the abyssal zone, ocean deeps, and basins. The average depth of the Arctic Ocean is 1,038 meters (3,407 ft). . The deepest point is in the Eurasian Basin deepest point, at 5,450 meters (17,881 ft). 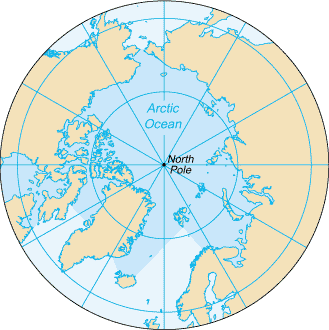 The Arctic Ocean contains a major chokepoint in the southern Chukchi Sea, which provides northern access to the Pacific Ocean via the Bering Strait between North America and Russia. 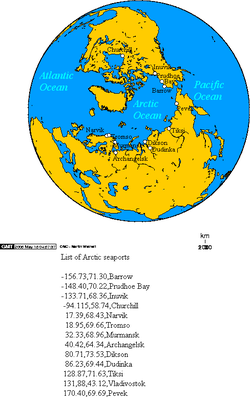 The Arctic Ocean also provides the shortest marine link between the extremes of eastern and western Russia. There are several floating research stations in the Arctic, operated by the U.S. and Russia. For much of Western history, the geography of the North Polar regions remained largely unexplored and conjectural. Pytheas of Massalia recorded an account of a journey northward in 325 B.C. to a land he called "Ultima Thule," where the sun only set for three hours each day and the water was replaced by a congealed substance "on which one can neither walk nor sail." He was probably describing loose sea ice known today as "growlers" and "bergy bits." His "Thule" may have been Iceland, though the Faroe Islands have also been suggested. Early cartographers were unsure whether to draw the region around the Pole as land (as in the map of Johannes Ruysch in 1507, or Gerardus Mercator's map of 1595) or water (as with Martin Waldseemüller's world map of 1507). The fervent desire of Europeans for a northern passage to "Cathay" (China) caused water to win out, and by 1723 mapmakers such as Johann Homann featured an extensive "Oceanus Septentrionalis" at the northerm edge of their charts. The few expeditions to penetrate much beyond the Arctic Circle in this era added only small islands, such as Nova Zemlya (11th century) and Spitzbergen (1596), though since these were often surrounded by pack-ice their northern limits were not so clear. The makers of navigational charts, more conservative than some of the more fanciful cartographers, tended to leave the region blank, with only the bits of known coastline sketched in. This lack of knowledge of what lay north of the shifting barrier of ice gave rise to a number of conjectures. In England and other European nations, the myth of an "Open Polar Sea" was long-lived and persistent. John Barrow, longtime Second Secretary of the British Admiralty, made this belief the cornerstone of his campaign of Arctic exploration from 1818 to 1845. In the United States in the 1850s and '60s, the explorers Elisha Kent Kane and Isaac Israel Hayes both claimed to have seen the shores of this elusive body of water. Even quite late in the century, the eminent authority Matthew Fontaine Maury included a description of the Open Polar Sea in his textbook The Physical Geography of the Sea (1883). Nevertheless, as all the explorers who trekked closer and closer to the pole reported, the Polar Ice Cap was ultimately quite thick, and persists year-round. Fridtjof Nansen was the first to make a naval crossing of the Arctic Ocean in 1896. The first surface crossing of the Arctic Ocean was led by Wally Herbert in 1969, in a dogsled expedition from Alaska to Svalbard with air support. The ocean is contained in a polar climate characterized by persistent cold and relatively narrow annual temperature ranges. Winters are characterized by continuous darkness, cold and stable weather conditions, and clear skies; summers are characterized by continuous daylight, damp and foggy weather, and weak cyclones with rain or snow. There is considerable seasonal variation in how much pack ice covers the Arctic Ocean. Much of the ocean is also covered in snow for about 10 months of the year. The maximum snow cover is in March or April — about 20 to 50 centimeters (8 to 20 in) over the frozen ocean. The average temperature is approximately -2° celsius. Ice islands occasionally break away from northern Ellesmere Island, and icebergs are formed from glaciers in western Greenland and extreme northeastern Canada. Permafrost is found on most islands. The ocean is virtually ice locked from October to June, and ships are subject to superstructure icing from October to May. The Arctic Ocean has relatively little plantlife except for Phytoplankton. Phytoplankton are a crucial part of the ocean and there are massive amounts of them in the Arctic. This is because during summer, the sun is out day and night, thus enabling the phytoplankton to photosynthesize for long periods of time and reproduce quickly. Phytoplankton can also reproduce by splitting themselves. Nutrients from the gulfstream and currents wash into the ocean too, making it the ocean with the most diverse wildlife. The Arctic Ocean is used by both marine mammals and nuclear submarines. Endangered marine species include walruses and whales. The area has a fragile ecosystem which is slow to change and slow to recover from disruptions or damage. The polar icepack is thinning, and there is a seasonal hole in ozone layer over the North Pole. Reduction of the area of Arctic sea ice will have an effect on the planet's albedo, thus possibly affecting global warming. Many scientists are presently concerned that warming temperatures in the Arctic may cause large amounts of fresh meltwater to enter the North Atlantic, possibly disrupting global ocean current patterns. Potentially severe changes in the Earth's climate might then ensue.